Legal History Blog: Funk Reviews Compton's "Evangelical Origins of the Living Constitution"
Funk Reviews Compton's "Evangelical Origins of the Living Constitution"
Kellen R. Funk, a Yale JD and a doctoral candidate in history at Princeton University, has posted Shall These Bones Live? Property, Pluralism, and the Constitution of Evangelical Reform, which is forthcoming in Law and Social Inquiry. It is a review essay based on John W. Compton’s The Evangelical Origins of the Living Constitution (2014). The Supreme Court of the New Deal era transformed the American Constitution, making the Constitution’s original protection of property rights give way to democratically popular regulations. 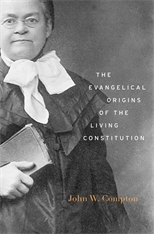 In The Evangelical Origins of the Living Constitution (2014), John W. Compton argues that twentieth-century progressives turned the Court towards a “living” interpretation of the Constitution by relying on legislative methods and judicial precedents created by nineteenth-century evangelicals. Evangelical reformers accomplished national prohibition of liquor and lotteries, but their regulations destroyed property rights that were legally valid and socially acceptable at the inauguration of the Constitution. Courts ultimately acquiesced in novel economic proscriptions because of overwhelming majoritarian sentiment driven by evangelical populism. Relying on a recent literature of law and religion, Compton challenges conventional accounts of America’s constitutional tradition of protecting property. This essay reverses the path of analysis and argues that evangelical concerns about the Constitution’s property clauses can alter standard accounts of law and religion in American history. Rather than a simplistic imposition of moralism, evangelical reform — like that of contemporaneous progressives and their descendants — sought to protect liberalism with regulations rooted in antislavery thought.